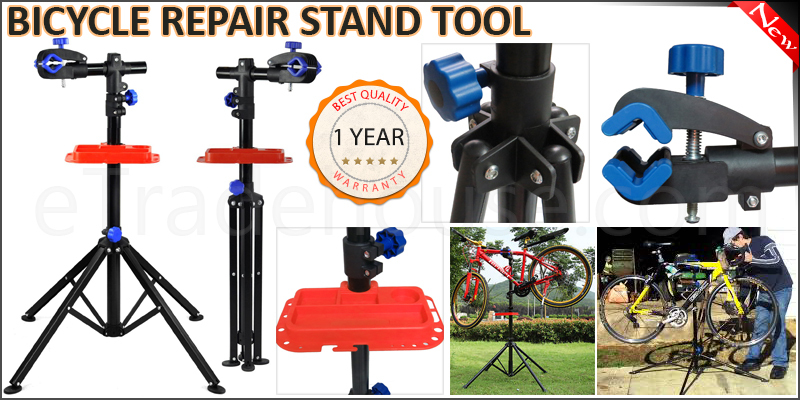 This 360° Rotatable Bicycle Mechanics Cycle Repair Workshop Stand is ideal for any professional bicycle mechanic or keen cycling enthusiast who requires a high spec heavy duty repair stand. It features a high quality robust heavy weight frame with a fixed leg design that gives maximum stability. It has adjustable rubber jaws on the clamp head which will hold a bicycle securely in place but won't scratch the paint finish. Fits standard frame from approx. 25mm to 40mm. Heavy duty construction with 4 folding legs for extra stability. Tray Bar: 30cm x18cm (L&W). Colour: Black Bike Stand with Blue Clamps. Bike Bicycle Repair Work Stand Rack. 1x Allen Key for Use with Cap Head Screws.